Opening Night was fun-filled in Beloit, but the Snappers were downed by their in-state rival Timber Rattlers 6-1 on Thursday night. A series of Wisconsin two-out singles in the third inning put Beloit at an early deficit before a seventh inning that featured four Timber Rattlers runs that put the game out of reach. Beloit starter Chase Cohen was tagged with the loss in his Midwest League debut; the righty allowed two runs over 3 1/3 innings while walking three and striking out two. The Snappers struck first on Thursday thanks to an RBI single from Marcos Brito, the A's No. 16 prospect, in the second inning. That would end up being the only blemish on the line of Rattlers starter Scott Sunitsch, who was otherwise brilliant. The southpaw allowed just the one run on six hits with no walks and six strikeouts. The Timber Rattlers immediately answered back in the top of the third. Brewers 2018 first-round pick and No. 3 prospect Brice Turang and David Fry hit back-to-back two-out singles before both advancing on a wild pitch by Cohen. Chad McClanahan plated both with a single of his own, giving Wisconsin a 2-1 lead. After right-handers Joe Demers and Eric Marinez relieved Cohen with 2 2/3 scoreless innings, Jeferson Mejia entered the game to start the seventh for the Snappers. He allowed a leadoff single to Pablo Abreu before walking Turang. Fry then extended Wisconsin's lead to 3-1 with an RBI single. Mejia followed by issuing back-to-back walks to McClanahan and Conor McVey, pushing another run across. The Timber Rattlers capped their four-run rally with a sacrifice fly from Jesus Lujano. With the seventh inning aside, Beloit's bullpen was stellar. Demers and Marinez struck out two apiece in their shutout innings while righty Calvin Coker threw 1 1/3 scoreless frames in his Midwest League debut. Flamethrower Wandisson Charles was arguably the most impressive, as he struck out the side in order in the ninth while flaunting a 99-MPH fastball. The Snappers recorded seven hits on the night, including multi-hit performances from Madden (2-for-4) and Payton Squier (2-for-3). Turang (2-for-3) and Fry (3-for-5) led the way for the Timber Rattlers. Beloit will look to salvage a split of their season-opening two-game series with Wisconsin tomorrow at 6:30 p.m. Right-hander Adam Reuss goes for the Snappers, opposed by Rattlers lefty Wilfred Salaman. 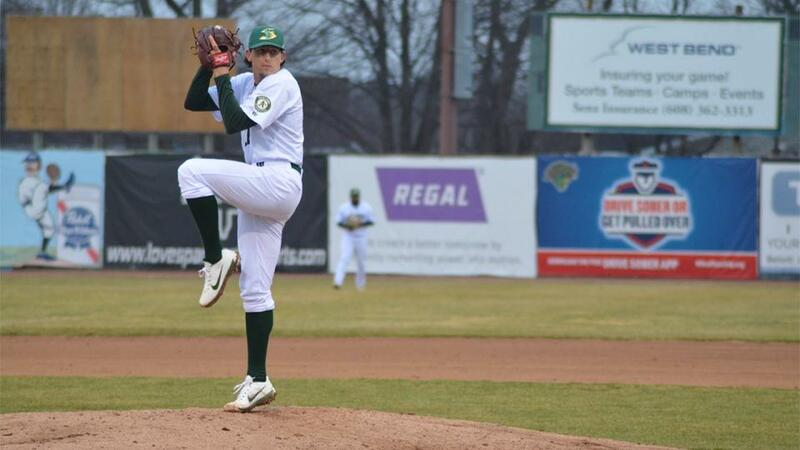 Reuss appeared in three games for Beloit in 2018, allowing four runs in 7 1/3 innings, though he spent a majority of the season with Short-Season A Vermont, where he posted a 3.98 ERA in 17 games (12 starts).